Azerbaijani Students and Alumni International Forum (ASAIF) and Islamic Conference Youth Forum will organize an exhibition of photos describing Khojaly genocide. The exhibition will be held on February 17-19 in Taksim Square of Istanbul within the “Justice for Khojaly” campaign. According to APA, brochures and books about the genocide of thousands of people will be distributed among the visitors and a film about the Khojaly events will be shown during three days. Special guests invited by Turkey and Azerbaijan will attend the opening ceremony on February 17. The main initiators of the action are Azerbaijani students studying in Turkey. 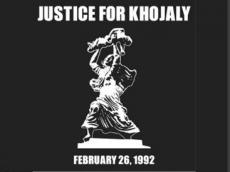 20 years have passed since Khojaly genocide, a bloody tragedy forever kept in Azerbaijani people’s memory.